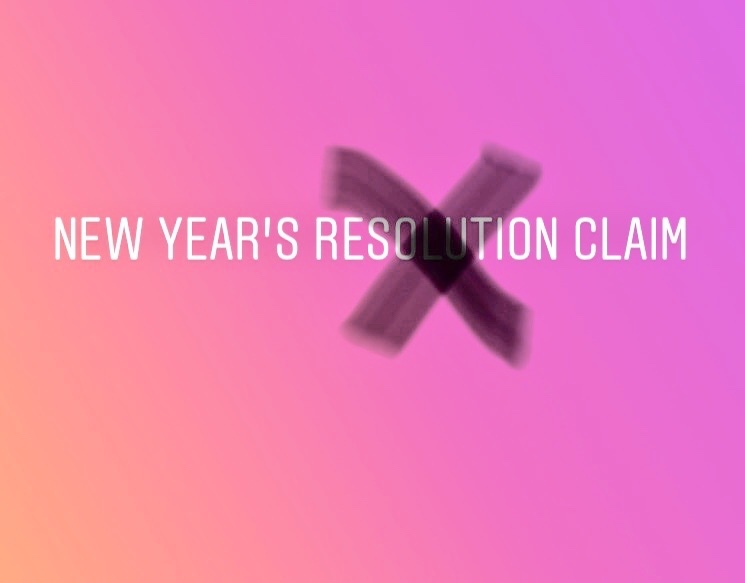 New Year's Resolution No Longer, Now It's My Claim for 2019! I love the New Year for many reasons but mostly because it allows me to reflect on what has happened over the last 12 months and gain perspective. To say that I am in a different place than I was one year ago is an understatement. Using my insta story and my camera role to re-create 2018 for me has been such an empowering experience. Taking the time to watch the challenges, actions, risks and accomplishments over the last year takes my breath away but somehow I didn’t realize it until I put together the recap. I am feeling very proud and very strong. I am feeling so strong that I have decided to take a different approach to the new year this year. In the past I have penned my annual New Year’s Resolutions like so many of us. After reviewing my past resolutions I began to see a pattern. I was typically writing very similar things each year. It would usually be something like put myself first, workout daily, commit to achieving my goals, be more present with my son etc. While they are great to write down I didn’t feel like it was game changing for me anymore. After I did my 2018 year in review on my insta story I felt I was ready for something more. I knew that I had achieved a lot that I had never anticipated in 2018 and if I wanted to go bigger in 2019 and have different results I needed to do something differently today to set the tone. That is when I decided to “claim” 2019 and write out and share what my claims were with the world. I can tell you that one year ago today I would have never done this. One year ago today I had not shared with others that I was finishing my first book and getting ready to self-publish. I had felt embarrassed and nervous and was full of self-doubt. The only thing that I felt ready to claim was my weighted blanket and a chardonnay to keep me calm until my book launched. I was nervous for the haters to come and fearful of failing at something new. Today, I no longer feel this way. Today, I reflected on my entire year and also on one specific occurrence. A year ago I had reached out to Lori Harder to ask her if I could be a guest on her podcast. Lori Harder is a former fitness model who now hosts the podcast Earn Your Happy which currently has 10 Million downloads. When I reached out to her January of 2018 I didn’t have a book and hadn’t been on that many podcasts. While she replied and was very kind she did let me know that she didn’t have any availability at the time but she would keep me in mind for the future. Going into 2018 I was essentially turned down for Lori’s show. After my book launched in May I began landing a lot of podcasts including Dr. Drew, The Lady Gang, The Jenny McCarthy show and many others. This summer I received an email from Lori’s assistant asking me to be a guest on her show. I tried desperately to schedule it face to face in California but the dates and times didn’t work so I agreed to do a skype interview for her podcast. We were locked and loaded for a November date. As the date approached I received another email from her assistant this time letting me know that they would need to reschedule as Lori’s schedule had changed. I went right back into the scheduling tool and booked the next available date which was December 2018. I have learned if you don’t jump right on availability someone else will and you will lose your shot. Booked for December and ready to go, I suddenly found myself with out a voice. After 6 months of traveling weekly to do book signings, speaking engagements and promote my book I had lost my voice. I did what anyone would do, I posted to Instagram and asked for advice on how to get your voice back. I received so many great ideas like gargling with salt water, using lemon and honey in tea and many others. I tried them all and while my son made signs for me to use at the house to save my voice I still had not gotten it back. I called the Dr. and got a z-pack and headed to a speaking engagement in Boston. I did not speak that whole day. I told myself my voice is going to be back I am certain. This trip is going to be fantastic and Lori’s podcast is going to be great. I willed my voice to come back and didn’t accept the idea that it wouldn’t. I landed in Boston jumped in the Uber and realized due to the flight being delayed and traffic I wouldn’t get to my girlfriend’s house until the moment that Lori’s podcast was starting. I didn’t know if my voice was back and I wasn’t going to have time to set up. I begged the Uber driver to hurry and get me there faster. I eventually arrived at my friends with 5 minutes to spare. I had enough time to go to the bathroom, gargle with salt water, set up my computer and launch skype to meet Lori and join her show. My voice was raspy to say the least. She asked if I was able to make the show work and I said absolutely. My stress level was high and it was obvious. We did the show and she let me know it would be out in a couple of weeks. Our show dropped on New Year’s Eve day. Getting the note that our show went live that day reminded me that a year prior I had started the ball rolling with getting on her show when I reached out to her initially. Sometimes things take a while to come to fruition and sometimes they don’t happen the way you want or would have hoped but they still work out in the end. If I wanted to make 2019 a bigger and better year I was going to have to start it off in a much more aggressive way. Last year I had written our my New Year’s resolutions an sent Lori Harder a direct message on Instagram, this year it was going to need to be more. Deciding to “claim” 2019 for me and share it with the world wasn’t as hard as I thought it would be. I wrote out on a piece of paper exactly what I was claiming for the New Year. I am claiming what I will be accomplishing in 2019. I will write my second book, launch my first show, meet with Reese Witherspoon to discuss making my book a movie, launch my product line to empower others, take bigger stages this year and bring more value to my audiences. Once I had written down my claim for the New Year I took it one step further and fired up my iPhone and recorded a one minute video sharing my claim and intentions with the world. I launched that video on my Linkedin page and on my insta story. In that moment the world was now holding me accountable to my claims. I was speaking my truth into existence and I was holding myself accountable. Making bolder moves sets the tone for a bolder and bigger year. What will you claim for your 2019 and who will you share it with? Our thoughts and our words are our most powerful tools, put yours to work for you and let’s see how far you will go. It all starts with one step. Heather Monahan is a best-selling author, keynote speaker with the Harry Walker Agency, brand ambassador for Perry Ellis International, entrepreneur and founder of Boss In Heels. Having worked nearly 20 years in Corporate America, Heather Monahan is one of the few women to break the glass ceiling and claim her spot in the C-suite. Heather’s a Glass Ceiling Award winner, named one of the most Influential Women in Radio in 2017 and Thrive Global named her a Limit Breaking Female Founder in 2018. She’s also a member of Florida International University’s Advisory Council to further serve as a mentor and leader in the South Florida Community. Ms. Monahan was the keynote speaker this year at the Entity Women’s Summit and Big Brother Big Sister Miracle Maker’s 60th anniversary luncheon. She is schedule to be the keynote at the S.H.E. Summit Bacardi 9/13, Horizon Media Limitless leadership NYC 7/31, BNY MELLON speaker series 9/14, Royal Caribbean Women’s event 9/12, Soho House Miami evening with the author 8/28, Zenith Media P.O.W. keynote NYC 8/21, WNBA Aces women’s empowerment event and book signing Las Vegas Mandalay Bay 8/15, Boise University Women’s Event 9/25, Greenberg Traurig Law Firm female partner’s event 10/3 among others. Heather and her son Dylan reside in Miami.